This Chinese tea, handed down from my mum, can help promote eye health. If browsing computer or reading a book for a while, we might feel our eyes itchy or dry. This Chinese tea, handed down from my mum, can help promote eye health. If browsing computer or reading a book for a while, we might feel our eyes itchy or dry. Sometimes when we work in an air-conditioned room for too long, our eyes also get dried as a result that our vision becomes not as sharp as it should be. I often make this tea once or twice a week for prevention. To make this tea, it’s very simple. 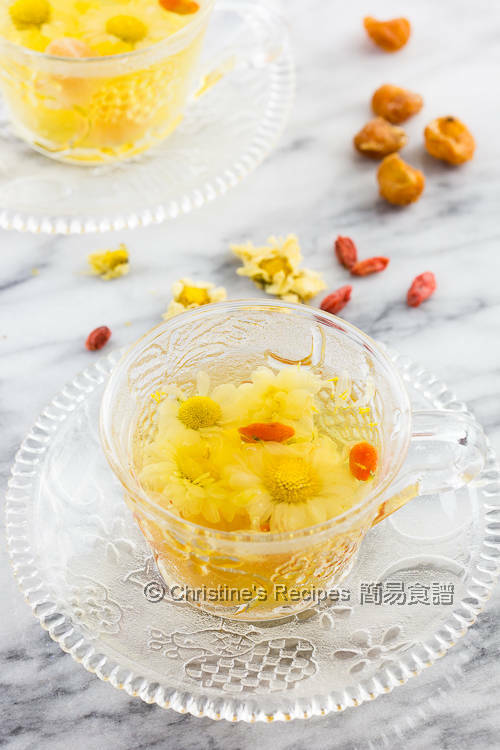 Simply brew these three things together, Chrysanthemum tea, Goji and Longan. In Chinese herbal medicine, Goji is a healthy food for eyes, Chrysanthemum flowers for cleaning our body heat, and longan for soothing our nervous system. This tea is very fragrant and gives a mild sweet taste. 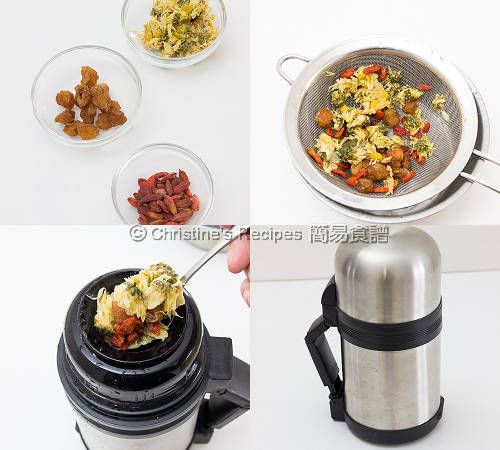 Rinse the dried chrysanthemum flower, goji berry and longan with cold tap water. Lastly, use boiling water to rinse. Drain well. Pour boiling water into a vacuum flask, then discard it. This will warm up the flask. 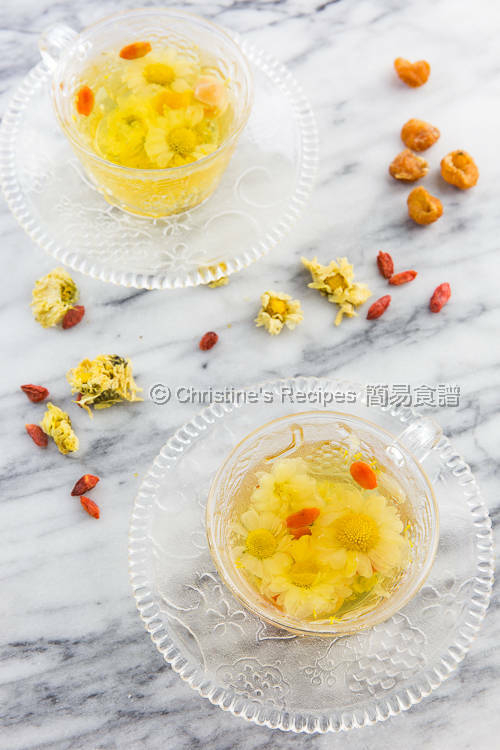 Put in chrysanthemum flower, goji berry, longan and 1½ cups of boiling water. Close the lid and set aside for 40 minutes. Drain through a sieve. Enjoy. Dried chrysanthemum flower is widely used to brew Chinese tea, available at Asian grocers. For the sake of hygiene, use boiling water to rinse dried chrysanthemum flower, goji berry and longan, you’ll be very sure that all the ingredients are very clean. Yet make sure to rinse briefly, not to soak, because you don’t want all the tastes to be gone. Or you might use boiled water that is completely cooled down to rinse the ingredients. Then you don’t need to consume any tap water. I like chrysanthemum tea, but have never added goji and longan in it. Sounds really interesting. Thanks for sharing, Christine.